The dark skies of Pie Town, New Mexico allowed me to have one of (if not the best) visual observing experience of my life. While my colleague, Muir Evenden and I were installing the Astronomical Telescope for Educational Outreach (ATEO) in the mountains of western New Mexico, we had the chance to do a few nights of visual observing. One of the staff members at SkyPi Remote Observatories, Michael, was generous enough to invite us to his home not far from the observatory to observe through his 20" Obsession Dobsonian Telescope. The views through this fine instrument complemented with the dark clear skies along with his 2" Nagler eyepieces were simply breathtaking. I could go on in this post about every single object I observed into detail due to how amazing they all looked. However, I wanted to share my experience with observing a new object for the first time... NGC 6888, otherwise known as the "Crescent Nebula". NGC 6888 - The "Crescent Nebula in Cygnus - T.A. Rector (NRAO/AUI/NSF and NOAO/AURA/NSF). After Michael showed me the Veil Nebula through his telescope, he asked me if I wanted to look at the Crescent Nebula in the constellation of Cygnus. I have read and seen images regarding this object, however, I have never actually observed it. After Michael slewed the telescope to the object, I climbed the ladder to take a glimpse and I was truly speechless! Michael had an Oxygen III filter (which is a necessity for this object) attached the eyepiece that allowed me to see the emission nebula in detail very much like the image above. Michael said some of his guest observers will say "it looks like an ear". The Crescent Nebula is about 5000 light-years away from Earth. It was discovered by Friedrich Wilhelm Herschel in 1792. 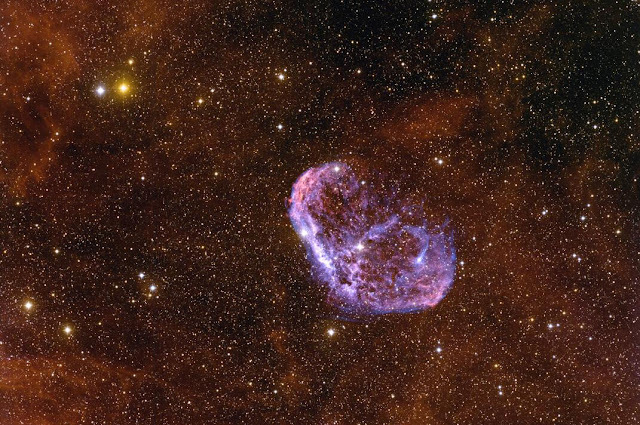 It is formed by the fast stellar wind from the Wolf-Rayet star WR 136 colliding with and energizing the slower moving wind ejected by the star when it became a red giant around 250,000 to 400,000 years ago. The result of the collision is a shell and two shock waves, one moving outward and one moving inward. The inward moving shock wave heats the stellar wind to X-ray emitting temperatures. After observing this object, I have added it to the list of deep-sky objects to image through the ATEO when it goes online within the next few weeks. We have an Oxygen III filter in the filter wheel attached to the telescope. A special thank you to Michael from SkyPi Online Observatories for introducing this fine object to me! It brought back great memories of what it was like looking at deep-sky objects through a telescope for the first time.